Properties in Gallipoli average 4.7 out of 5 stars. Property 2: SPLENDID VILLA ON THE SEA IN GALLIPOLI: YOUR HOLIDAY AT THE TOP IN EVERY SEASON !!! Property 4: Villa with swimming pool, park and private pine forest, 100 meters from the sea. Seaside Apartment . 3 Double Bedrooms and 2 Bath. Property 9: Seaside Apartment . 3 Double Bedrooms and 2 Bath. Gallipoli, 4 beds, walking beach, terrace with sea view. Property 12: Gallipoli, 4 beds, walking beach, terrace with sea view. Independent terraced house in Baia Verde (Gallipoli) known seaside resort. Property 17: Independent terraced house in Baia Verde (Gallipoli) known seaside resort. House by the sea, Rivabella (Gallipoli), 5 + 1 p. the. 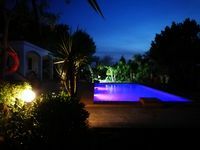 Property 35: House by the sea, Rivabella (Gallipoli), 5 + 1 p. the. Truly a.lovely spot. 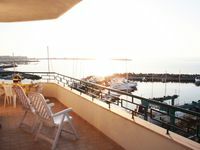 This large apt fronts the building, overlooking a marina, and the sea. It subsequently has endless fresh air blowing through its many patio doors, and stays cool through the day without canned air. Parking is free in front of the building, and seems very safe. It's a short walk through a tunnel very close to the building, to the main street of Gallopoli, Via Roma. Lots of restaurants, shops, cafes within minutes of the apt, and a fantastic supermercado about 5 minutes away by car called &quot;family&quot; along the lungomare (left from the apt, through two roundabouts, keeping left each time. Good bread, cheese, meat, produce etc...and great prices. I loved staying here. Gallipoli is charming, as are the very helpful owners of this apt..... Luigi and his wife are friendly and kind. I could see.myself staying here again...its very pleasant overlooking the water, and taking in the fresh sea air. There are only two negative points I could possibly make and they are that the dogs guarding the marina by night bark constantly when they see or imagine motion, and, the beds are honestly not terribly comfortable. Pretty hard and unforgiving. A great shame, because the apartment is marvelous. Nearby beaches are beautiful (lido gallipoli) and the old town (centro storico) is wonderful. Recommended!! Nice location. Beautiful villa. Lovely garden. Fantastic pool. A lot of privacy. Dedicated owner. We&rsquo;ve had a fantastic time in Marina di Mancaversa - Gallipoli. Many thanks to Milena and Vincenzo. Ciao!